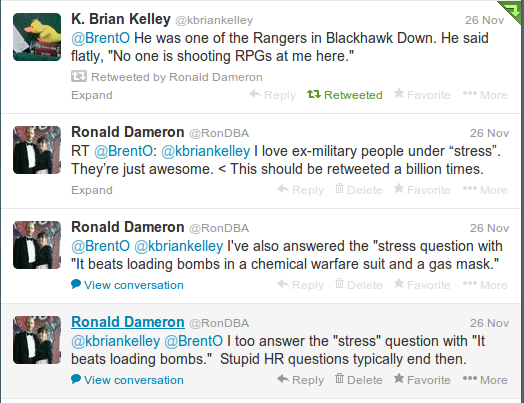 Ronald Dameron - The Only DBA: How do I handle stress at the office? It beats loading bombs. How do I handle stress at the office? It beats loading bombs. When you've done this for a living. This isn't usually that hard. I recall a discussion on Twitter about how IT pros handle stress. 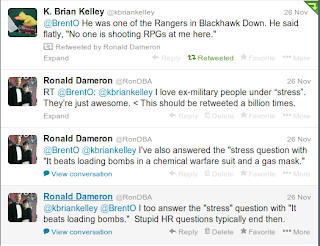 When a production outage occurs, wouldn't you rather have someone who has safely handled bombs? Anything at the office is a cake walk after loading bombs or having RPGs shot at you. Hire a vet. I salute our nation's veterans on Veteran's Day.